In the Official Gazette no. 963, from 14.11.2018, was published the Government Emergency Ordinance no. 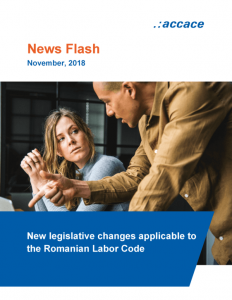 96/2018 amending and supplementing the Labor Code – Law no. 53/2003 republished. Please note that the minimum gross salary is to be increased by Government Decision either from 01.12.2018 or from 01.01.2019, but this document is still in the project stage. We will revert with more details after the approval and publication of the Decision for the establishment of the minimum gross basic salary per country guaranteed in payment. For more details, please contact our experts from Romania! What provisions should be included in the company’s mandatory Internal Regulation in Romania?